-tures of man seemed nothing amidst the beauty of grandeur of the works of God." Lower down, about half-a-mile nearer Cromford, there is another enjoyable eminence, known as FOX CLOUD, whence a view of the country, less comprehensive but equally beautiful, may be obtained. 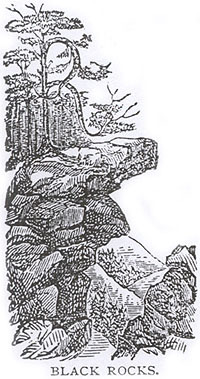 The route to Matlock-Bath is remarkably pleasant and suggestive for throughout its entire course the contemplative mind, tuned to harmonious meditations on the wonders of creation, may find at each step. 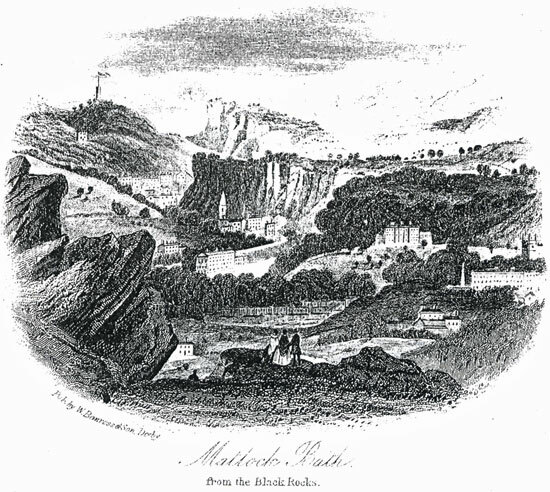 Should the tourist be disposed to stayawhile at MATLOCK- BATH, there is no place where more agreeable accommodation can be found for a lengthened residence, and none from which excursions to the adjacent districts can be made with greater pleasure and convenience. Nor is any locality richer in natural curiosities, places of modern interest, or historic remains of antiquity. The drive to the Parish Church of MATLOCK (proper), which is nearly two miles distant from Matlock-Bath, passes the prominent rock known as the HIGH TOR, and through a tract of country which exhibits to advantage the peculiar scenery of this romantic dale. The village is pleasantly situated, partly in a valley and partly on the side of a hill on the eastern banks of the river Derwent, a little way from the main road, At its entrance is a neat stone bridge, at a short distance from which, on the verge of a romantic rock, the Church dedicated to St. Giles raises its grey turret, shrouded by trees of luxuriant foliage. The building is an old embattled structure, having an ancient tower with pinnacles whimsically sculptured with grotesque gurgoyles. afterwards hung up in the church. These chaplets are sometimes made of white paper in imitation of flowers, and inside of them is generally a pair of gloves. They are intended as emblems of the purity of the deceased, and - the crown of glory which she has received in heaven." The allusions to the custom of laying "garlands on the hearse" are very frequent in the writings of the old poets. The Church contains no ancient monument of note, unless we may so designate that of Anthony Woolley, proprietor of Ryber Hall, who died in 1578, and Agnes his wife; although the records of the manor date back to the time of the Norman Conquest. A handsome Independent Chapel, in the Gothic style; with a spire, has just been built, and forms a pleasing object from many points of view.